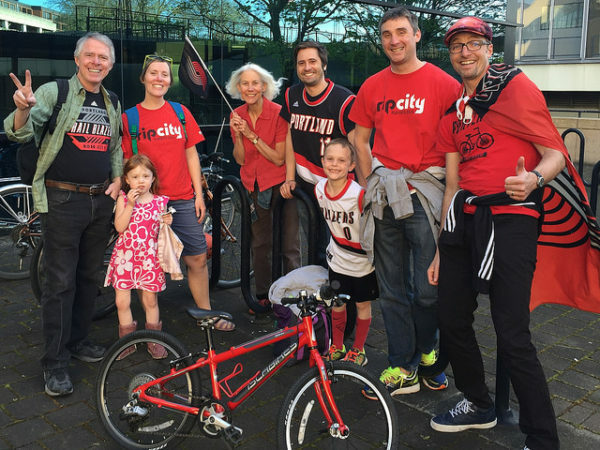 Home » Blog » We Are a Trail Blazers Community Partner! We Are a Trail Blazers Community Partner! How about this for some exciting news, shared just in time for Transportation Night? Yesterday, the Portland Trail Blazers announced the team’s five nonprofit community partners for the next two seasons. The Community Cycling Center is thrilled to be a community partner, along with four other incredible organizations! The Portland Trail Blazers chose its community partners based on the critical services they each provide to kids and families throughout Oregon and SW Washington. The partnership with the Trail Blazers will include promotion through the Trail Blazers Foundation 5050 raffle, youth basketball initiatives, player appearances and staff volunteer events. To learn more information about the community partnership, please visit trailblazers.com/community/partners. About the Photo: Community Cycling Center staff member Becky Morton, her family, and Jonathan Maus. Photo courtesy of BikePortland.org.